Fiat has manufactured small vehicles that were designed for driving ease in the city. This is a popular brand known worldwide. Each of our Fiat convertible tops is manufactured to original pattern specifications and we offer the original fabric selection. 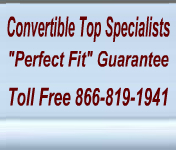 Our Fiat convertible tops will instantly renew your vehicle to show room condition.